I was really fortunate today to find myself at Leo’s Beanery once more. It is such a good place for gluten free food, coffee, cakes and general ambience. You skip down steep steps into a Howe Street basement and then you find yourself in the Tardis! And it’s a Tardis where EVERY cake is gluten free. Yes, you read this correctly – every cake. Before hitting the cakes, I had a salad from the main menu which has good gluten free choices. I went for a beetroot, goats cheese, lentils and squash salad. It was very good and generous and came with a portion of gluten free bread on the side. This was offered by our server and we did not need to ask, which is always a joy. Goats cheese and beetroot is a good combo and with dressing and some quite gutsy leaves, this was a wholesome salad, ideal for lunch. My fellow diner, let’s call her Gluten-Eating Lucy, had an equally good looking, potentially gluten free salad of chickpeas and punchy leaves. I was so taken with my beetroot that I forgot to explore her choice sufficiently, but it looked as good and wholesome as mine. However, when it came to the cakes, we took things a bit more seriously. Gluten-Eating Lucy had an excellent cup of coffee and a gluten free (you will remember, all cakes were gluten free) peanut slice, which had the taste of a Canadian colleague’s Nanaimo Bars: lots of sugar, peanut and chocolate – hugely indulgent. My choice was the chocolate brownie cake. This had a lovely sludgy filling and a brownie-like texture, with a bit more chocolate on the top for good measure. It was not too rich and although it looked huge when it came, it was actually very light and totally delicious. I also highly recommend the carrot cake, which I have had before. 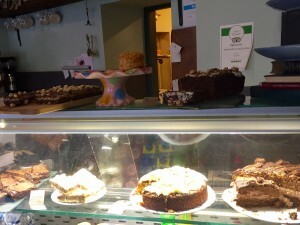 Great friendly service, a brilliant vibe and all those gluten free cakes. Who could ask for more? The cafe also does a great range of breakfasts and is open early 7 days a week. Also at Leo and Ted’s on Leven Street in Bruntsfield and Leo’s at the Dovecot Studios.